The U.S. Air Force has released a request for proposals for a potential $16.3 billion program that seeks to build a new trainer jet designed to replace the T-38 aircraft and train pilots of F-22 and F-35 fighter jets, Air University reported Friday. The RFP for the Advanced Pilot Training program covers engineering and manufacturing development, sustainment transition services, low-rate initial production and full-rate production. The T-X program’s RFP also contains contract options to produce a total of 350 trainer jets under LRIP lots 1 and 2 and FRP lots 3 through 11 as well as provisions for training systems, spares, support equipment, mission planning and processing tools and other ground support platforms. The service branch plans to make a contract award this year in an effort to achieve initial operational capability by the fourth quarter of fiscal 2024. “T-X is one of our beta cases for [cost capability analysis] which is one of our many [bending the cost curve] initiatives, ” said Air Force Secretary Deborah Lee James. The military branch released the RFP after it received an acquisition decision memorandum from the defense undersecretary for acquisition, technology and logistics, the report added. Industry teams that plan to bid for the T-X program include Boeing (NYSE: BA) and Saab; a consortium of Northrop Grumman (NYSE: NOC), BAE Systems, L-3 Communications (NYSE: LLL) and Rolls-Royce; Lockheed Martin (NYSE: LMT) and Korea Aerospace Industries; a consortium of Raytheon (NYSE: RTN), Leonardo, CAE’s U.S. arm and Honeywell’s (NYSE: HON) aerospace business; General Dynamics (NYSE: GD) and Alenia Aermacchi; and Textron and AirLand Enterprises. 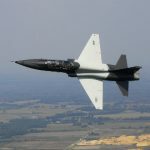 Sierra Nevada Corp. and Turkish Aerospace Industries also plan to pursue the T-X contract with the establishment of a new company, Freedom Aircraft Ventures, in Colorado, according to a report by James Drew for Aviation Week and Space Technology.